When he�s not guiding Santa�s sleigh, Rudolph is delighting in one of our most whimsical Christmas wreaths. 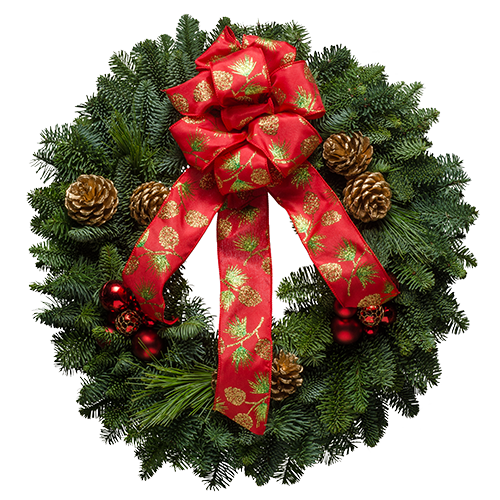 The fresh scent of the Cascade forest�s Noble Fir combines with the ruby red trinkets, dazzling gold pine cones and designer bow to create a wreath that will be one of your favorites, too! "For the second year in a row, I have ordered wreaths from you through our fundraising program, to send to my deployed brothers. Last year, I sent it to my youngest brother who was stationed in the Phillippines. The Filipino children especially loved the wreath because pine trees do not grow there and they were fascinated with the pine and the scent. When he left there to come home a few days after Christmas, he left the wreath there, hanging it on the door of a hospital they had just opened."